Mastering all these strategies can potentially skyrocket your website traffic and online profits, if you knew how to harness this extreme power of Facebook. You dont even have to have a website, you can just use affiliate products for this as well. 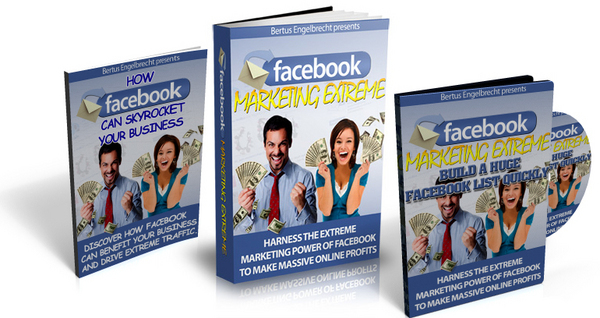 There are so many ways to make money with Facebook, the possibilities are truly endless. Introducing - Your competitions worst nightmare! Facebook Marketing Extreme! This complete course will show you step by step how you can harness the power of Facebook to market to its 450 million users and drive insane amounts of highly targeted traffic to your site. * *Secret* script that will get tons of members to your group. * 2 case studies that paint a picture of how Facebook ads work best to help you instinctively grasp it better than if you were poring over fine print guidelines. * An actual example of 11 ways to support your Facebook Advertising to help you make sure youve covered all the angles. Want me to show you EXACTLY how to build your own personal Facebook subscriber list? * How to make this group go viral so that you have a huge Facebook subscriber list. * How to market this group for every pennys worth. * How to use a *Secret* script to get loads of group members almost instantly. Not sure how Facebook will benefit your online business? Hundreds of internet marketers just like yourself is getting in on the Facebook craze and is already using it to drive traffic to their websites and affiliate offers. They are making an absolute killing out there! Dont you think it is time you get in on the action?